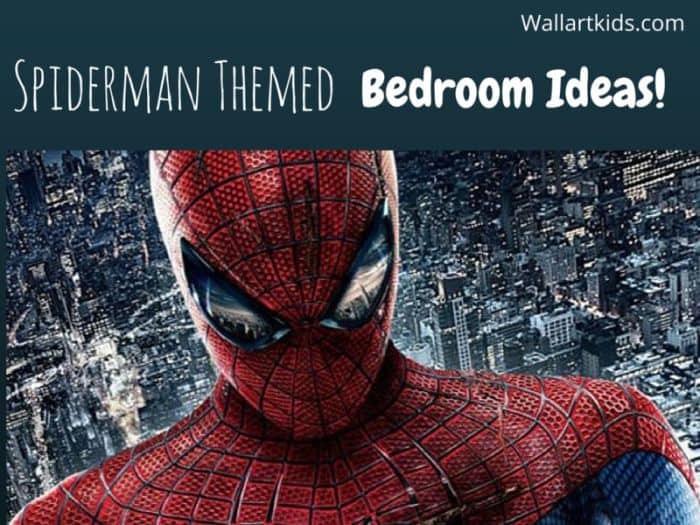 Spiderman Themed Bedroom – ideas! 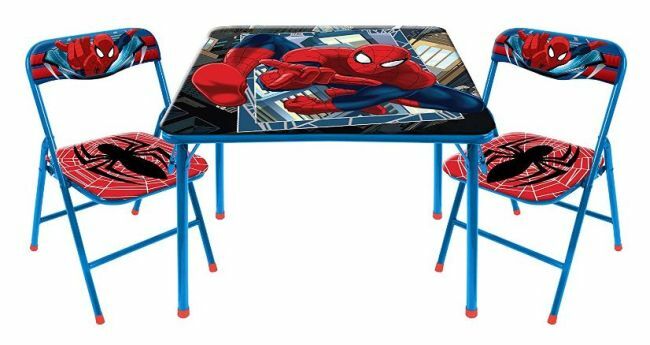 For the Spiderman Superfan – Spiderman themed bedroom ideas! 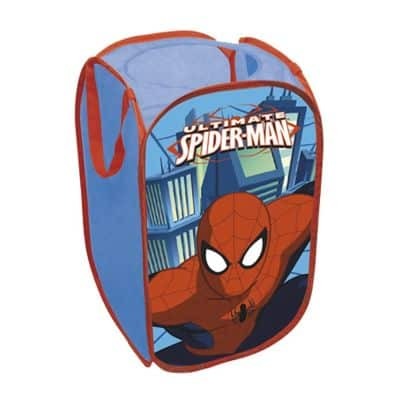 Is your Child’s favourite superhero Spiderman? For my youngest son, it’s a close one between Batman and Spiderman! In his honour, I have been seeking out some cool Spiderman stuff and I thought I’d share it with you! I used to love the idea of having a themed room as a child, but I never had a typical one. The closest it came too, was having a sort of mystical room, with moon and star decorations, twinkle lights and wind chimes. Actually, it even had a mini waterfall in there, (one that was meant for actual gardens, not bedrooms!). I loved it. So, maybe it’s because of the memories I have of that room and that it felt special to me, is why I love the idea of themed rooms now. Creating a room around your child’s favorite interest, character, book or hobby will be something they’ll remember vividly forever – I may not have had a typically themed room, but my mystical room was my little retreat from everything and I felt very lucky to have it. So, if Spiderman is the target, what sort of products are available? Check below for some inspiration, followed by some Spiderman related furniture and decor! 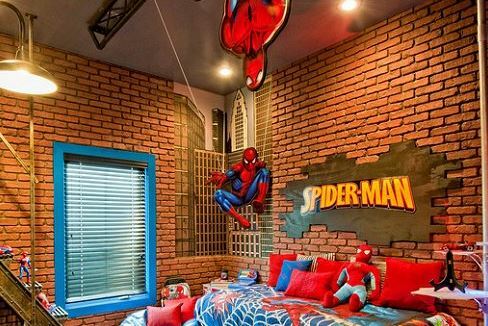 This is a great design, with the bare bricks, Spiderman merchandise, toys and wall stickers. It makes it clearer to imagine how simply a room like this could be recreated. I like the way there is string coming from the ceiling, representing his web and a Spiderman figure hanging from the ceiling. 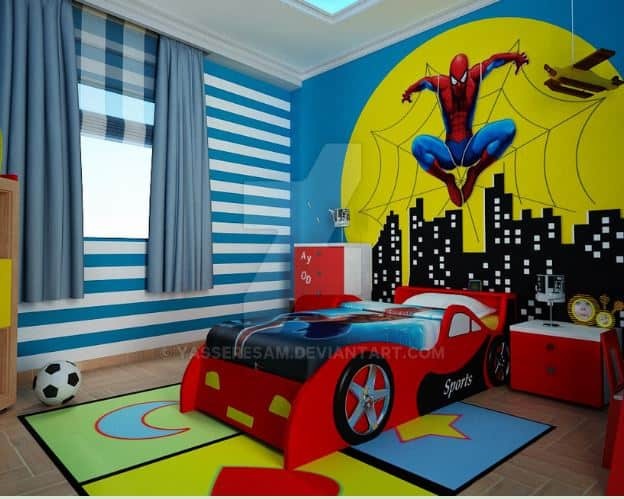 The amazing wall on the back of this Spiderman room, could be recreated with wall stickers and stencils/decals. 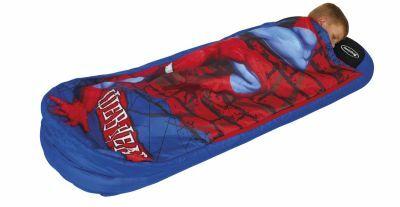 It also makes great use of a car bed, by incorporating it into the Spiderman theme – which looks awesome. Again, above the room makes use of an image that spans the entire width of the room – plus a nice touch having a ladder that goes through a hole in the ceiling – very cool! 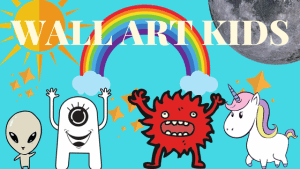 Check out some products you could use to create your child’s dream room below…. Didn’t you always want a bed with a slide? (Hmm, I think I’d still like one!). This style of bed would have been a dream. If you have the space, it would be a lovely choice. Includes curtain and slats, slide & tower. I believe it’s only available in the UK at the moment, but click the link below for availability in your country. As the full bed isn’t always available – what you can do is get the actual mid-sleeper bunkbed with slide, found here. 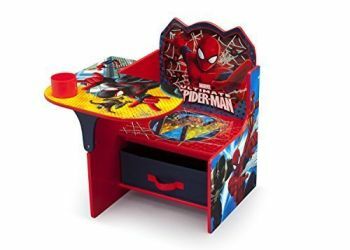 Here’s a really sweet and compact spiderman desk with chair – great for drawing, playing or snacking! Chair with attached mini desk. Small drawer underneath for storage. Is this desk available? Check here. I’ve already mentioned this wall light before, in a post I did regarding my top 10 wall lights for kids. There are some great ones available, relating to different themes – such as Frozen, star wars or minions. They’re all great and I think add an extra special touch if you’re going all out with a themed room…. plus, they’re not expensive! Bonus! Child safe, as there are no wires, the light does not heat up. Uses energy efficient LED bulbs. Check availability on Spiderman wall lights. Great for when friends come to sleep over – what better than being able to provide a readybed that matches the theme of the bedroom? These handy little beds are great for taking on sleepovers too, camping or staying with relatives when there is limited space. An inflatable mattress and pillow in one. A built in cover that can be easily removed and washed. Includes a carry case and pump. Find your Spiderman ready bed here. 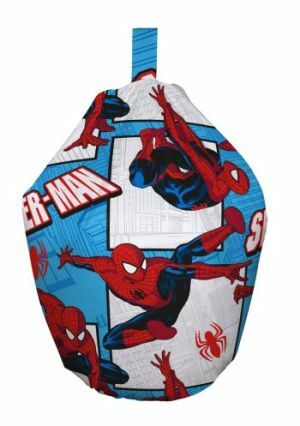 Something comfortable and fun to sit on in your Spiderman themed bedroom! Beanbags are always a winner. Simple to clean, just sponge it down. High quality, hard wearing cotton. Max protection against bean spillage. Find a beanbag selection here. Storage is always essential in any bedroom and this easy storage solution, means that kids can, (hopefully!) tidy up their own toys easily – with these simple pull out boxes. Full assembly required, instructions included. 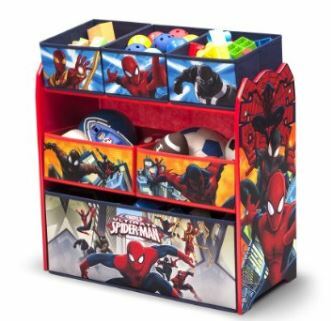 Spiderman storage selection available here. We have gone through a couple of different sets like this in our house and they’re great for playing games, drawing or eating. Set contains a table and two chairs. Easy to store, as you can fold it neatly away. This could be used for multiple uses storage wise. Always handy to have some extra storage available. Simple to use, pop up design, no assembly required. Carrying handles, light to carry. Find Spiderman Pop Up Bin. If you don’t go the whole hog and get a Spiderman themed bed, then getting a spiderman duvet set is the next best thing. However, if you’re going to go for a full on theme, a good related bedding set is going to be one of the essentials. dimensions – 135 x 200cm. Includes one pillow case and one duvet cover. 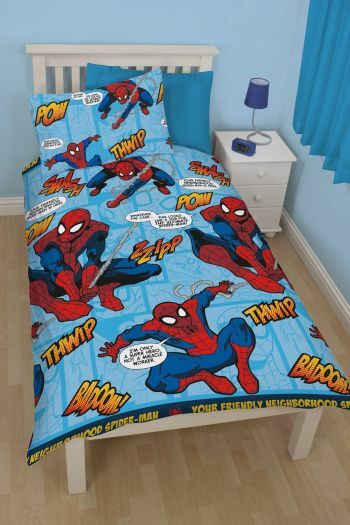 See what Spiderman bed sets are available. Using wall stickers is a cost effective way of giving a themed room a big WOW factor. So simple to apply and use and yet they can look amazing, they’re usually really inexpensive to buy as well – which isS a bonus! 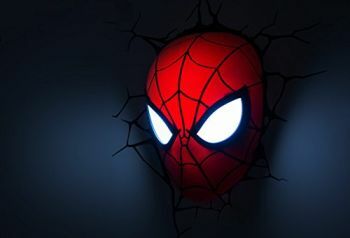 You can also check out other Spiderman wall stickers here. Comes with 19 stickers in total. So easy to apply – peel & stick. You can also remove and reapply easily. 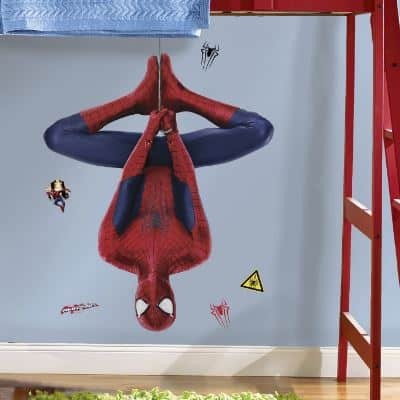 Find Spiderman swinging Wall Sticker. I didn’t have gadgets like this as a kid, did you? If your child worries about going to sleep in the dark, maybe having their favorite super hero watching over them would help!? As it’s an LED light, it doesn’t get hot and will be safe with them in their room. LED projector, projects images up onto the ceiling. 3 different wheels come with it, with different images. Simple for your child to use. 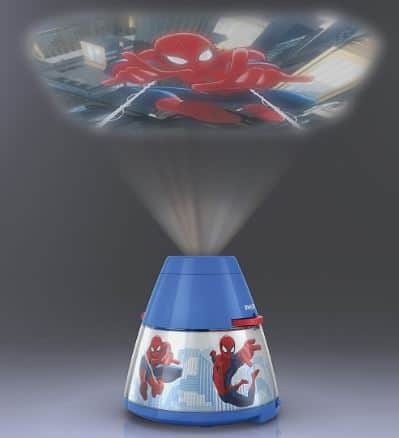 You can find a Spiderman Projector light here. 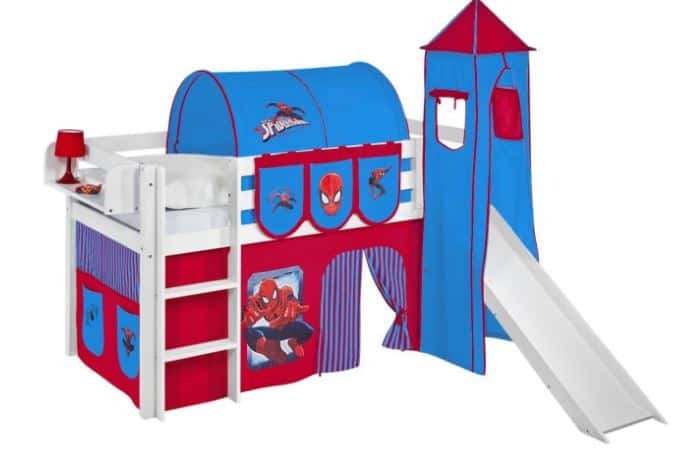 I hope this post has helped you generate some ideas for your Child’s Spiderman themed bedroom. Please, leave me a comment below and let me know what you might be getting and share any of your ideas! If you enjoyed this post, you may also be interested in….. Thanks very much for all of these great ideas. I’ve been trying to help my sister decorate her sons room and these ideas are perfect. My nephew also likes Spider-Man and I can’t wait to see his face when he sees what we’ve done to his room. There’s really nothing cooler than to see the happiness in a child’s face. I can totally understand what you mean she you say how much you cherished your room as a child. I was the same way. I didn’t have a themed room but I took a lot of pride in my room and I know I would have loved it if it were themed. Aw he’ll love it. You’re welcome – I hope he gets a great room sorted soon! While I know its not common for adults to have a room decked out in Spider-man, my buddy that went to High-school loves Spidey. Besides posters, I never knew what to get him, However I love the 3D Wall Light mask! Thanks for the great ideas! I now have something to get for our next gift exchange! Hi Natalie, lovely ideas my grandchildren are into spiderman and batman so this gives me so many ideas to share with my children for there childrens rooms, i love the spiderman man light coming through the wall, its amazing what you can do these days to give a room a great effect plus i think it really makes them appreciate there room more. I remember if i ever had new wallpaper up i would love to show it off to my friends. I love the storage desk and chair that is such a great idea and lovely effect, its a shame its so pricey:( both my grandchildren would love that, do you know of anywhere cheaper?. Well done very informative. Hey there – are you in the UK? In that case, that desk and table is imported from the US and hence, why it’s so expensive, (only around $40 there). However, this table and chair set is cute and it’s only Â£39.99 so, more affordable. Many thanks for stopping by and leaving a comment and pleased you got some ideas!